We decided to work with live-hinges for our first project. We started off by concept proving through black foam. 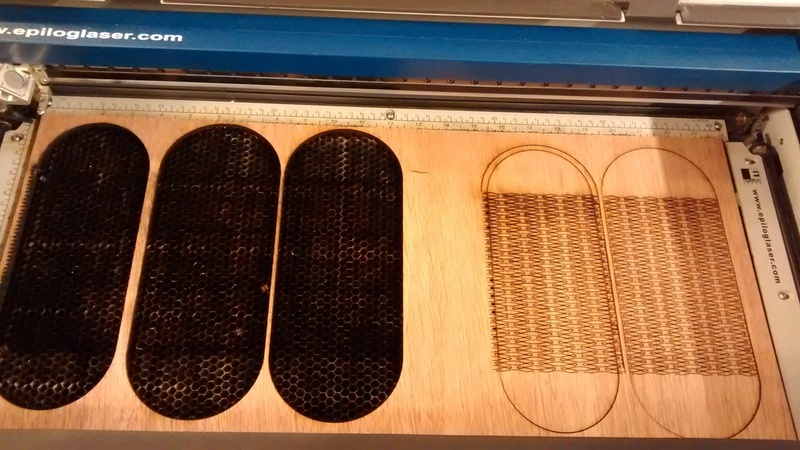 After some tests, we chose the "parametric kerf #6" pattern given to its generous flexibility. For our overall box concept we combined the live-hinge method with a for dice semi-cubed volume. The next step we took, was to start cutting the two apparently replicated pieces. However, our estimates for covering the half circles was inaccurate, avoiding the planes to fully assemble one-another. For our second iteration, we follow Eric's advice and jump to prototype with our final material, wood. This we planned and did a little calculations to make sure the sides height would match to the half circle perimeters. 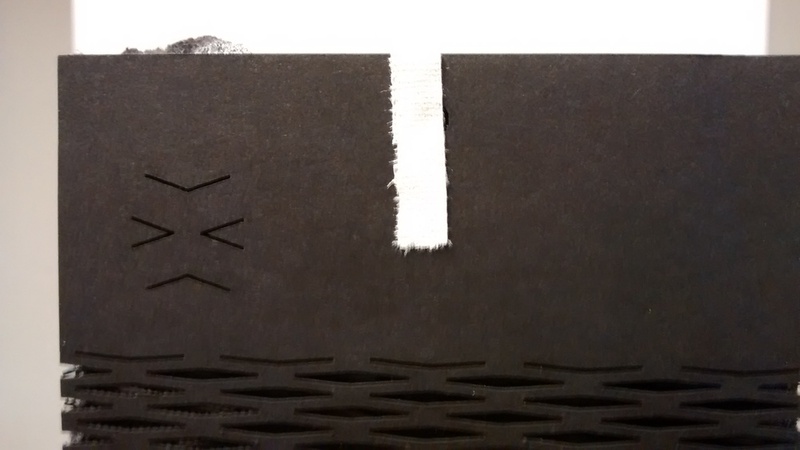 We also planned for 45º edges, so we created 5mm inner reference raster-edges to sand after cutting. Since the material is 5mm thick, we realize that for 45º edges we needed a "square" reference to more less know our limit when sanding off the residue. On our second laser cutting attempt, we came around with some technical unexpected obstacles. Besides overestimating the setup a bit high, the machine also cut offset (unknown reason still). Last but not least, the 60W laser cutter settings are different from the 50W when it comes to edging/rastering with black. This third setback was in fact a happy accident that allow us to realize we could simplify the entire process by scaling one of the sides by the thickness of the material. Our third cut run quite smoothly. We even explore ways of conveniently bending wood with warm water and overnight drying. The result wasn't perfect, but we now know how to make a perfect matching wood bending from what we learnt with this first experiment. In the end, our thought magnetized-closing lid wasn't necessary. This is our final prototype, along with our inspirational dice.